But after the holidays, there is the precedence to start thinking about the new year. New Year's isn't just a time to reset life goals: it's also a time to set the tone for the year fashion-wise! And what better way to do so then to check out what colors will be "in" for the entirety of 2014?! 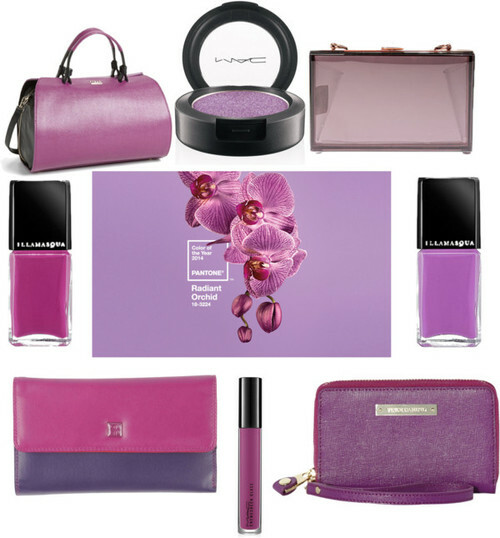 Pantone recently announced their Color of the Year for 2014: Radiant Orchid. When I first saw what it was, I must admit I was a bit skeptical. If you step into my wardrobe, you'll notice lots of dark tones and neutrals, so the idea of something vibrant and near-flourescent rattles me a bit. And then I started hunting through my cosmetics. And guess what, I guess "Radiant Orchid" isn't so bad after all. . . I found plenty of the color family in some of my favorite products. Plus, cosmetics and accessories are the perfect way for someone that is leery of color to incorporate it into a look! So what am I eyeing now that I've fallen for this purple-pink hue? Of course, lots of makeup and bags! If I were to purchase any of these items, how great would they look along side a grey skirt or black pants to add a bit of warmth and color? What is so appealing about this color is that it really would look chic year-round. In summer it'll be the bright shade in a floral-printed top and winter it'll be a great addition as a scarf alongside a classic peacoat. In what ways might you use this color in 2014?